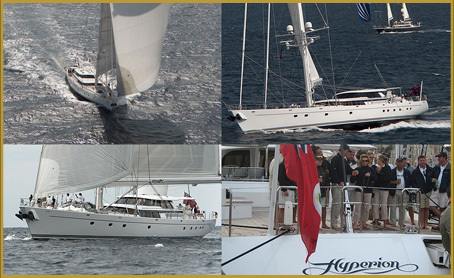 2006 see the great victory of magnificent sloop "HYPERION" and now hunt is open for the second "Cannes Croisette Cup" held 24th to 26th September 2009. 8 boats joins 2006 event, and we attend a maximum of 25 Super Yachts for 2009.. Thank you HYPERION, TAMER II, ATTIMO, BARTABAS, MARIETTE, SKYLGE, UNPLUGED and JULIE MOTHER for being our pioneers. We want to thanks Guy Leymarie C.E.O De Beers, who trust on our idea from the bigining, and offers to competitors Three fantastic trophies: "The Treasure" from their "Talisman" collection, for the first time in the world new Diamonds collection presented at delightful owner's dinner in Palm Beach Casino, and the Perpetual Diamond Trophy winning by SY HYPERION represented by her Captain Andrew Barry. Lot of thanks also to all who contribute to make our event a great success and all team who works hard to build a luxury unique event. Thanks to owners, captains and crew. In behalf of my team, Welcome on board for the 2009 Cannes Croisette Cup.